Volunteers are great people! If you volunteer for anything, thanks a bunch. Through my work recently we hosted a Shoreline Clean-up Day and were honored to have numerous people show up and volunteer their morning to clean up garbage along the local rivers. These folks braved cold water temperatures, whipping willow trees, disgusting smells, and my barbequed hot dogs, just to help make the local environment a bit cleaner. That is truly amazing and to those people I say thanks yet again. I often volunteer, and I have to say I always get something out of it. I learn a lesson, I meet a new friend, I gain respect, I feel proud of my community and myself. If you don't believe me then you should try volunteering sometime and see what I mean. I am not kidding. I challenge you to get out there and volunteer 2hours a month (which is nothing by the way). Chose an activity that you do already and teach someone else about it, pick trash up along a road you always drive, cook a meal at a soup kitchen, heck even start a soup kitchen in your area...I double dare you. 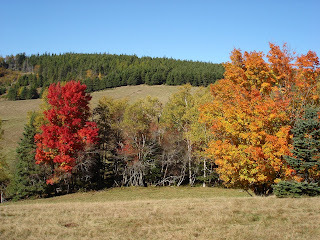 My pic for this blog is self explanatory with fall in the air.